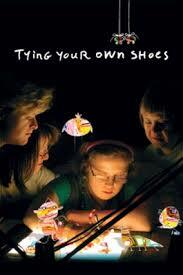 The title “Tying Your Own Shoes” is a reference to a comment made by one of the participants in the making of this film—she said that when she was born with Down syndrome, her parents were afraid that she wouldn’t ever be able to tie her own shoes (clearly, this fear was unfounded). Using narration and animation, the film illustrates the stories of four adult artists whose lives have been influenced by Down syndrome. Unlike other films that have explored the syndrome, this film allows the four participants to tell their stories with their own words and illustrations—it is an exploration of life by Petra (age 36), Matthew (age 22), Katherine (age 22) and Daninah (age 41), rather than about them. This simple shift in perspective makes the film a moving portrait of four people who, although they perceive themselves as being unusual and having special needs, have flourished and found fulfillment as functioning adults and artists. They show that their hopes and fears for life are no different from those of other people, and they express their pride in their own abilities and accomplishments. In the film we hear the four participants talking about various issues in their lives and see images that they created and animated for this production. In recognition that clarity of speech is a problem with the narrators, and to facilitate the viewer’s understanding of their words, the narration is subtitled (in the narrators’ handwriting) throughout. This film will increase the audience’s understanding of Down syndrome and help to break down barriers often imposed on people with special needs. It could be used to educate children or adults about Down syndrome, to introduce discussion about ability/disability, diversity, acceptance and inclusion and to promote empathy. A study guide is available. Extras on the DVD: a second track of the film is overlaid with commentary from the film-maker, giving insight into the project and how the four participants were chosen; another animated film by Shira Avni entitled John and Michael. This review is from Canadian Teacher Magazine’s March 2010 issue.